This entry was posted in VNNC Outreach Committee on February 28, 2018 by vnncadmin. 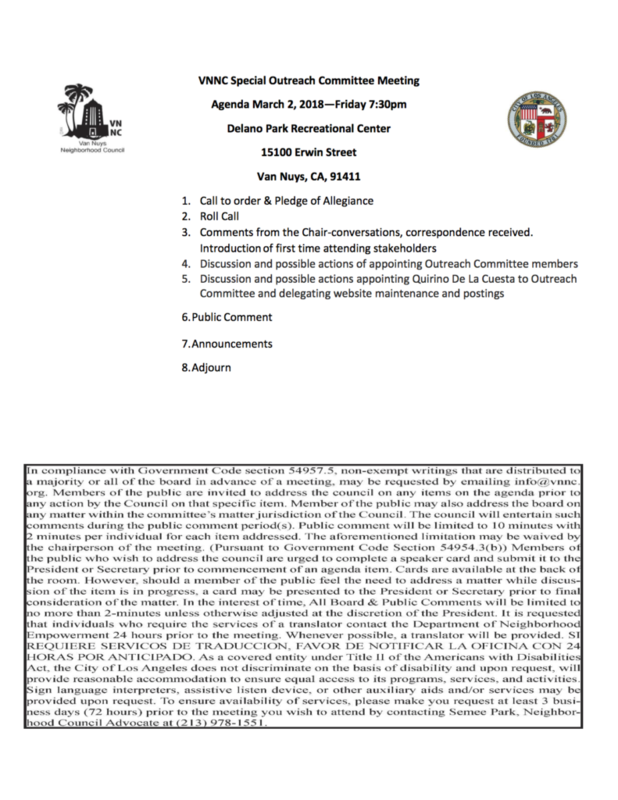 This entry was posted in Van Nuys Neighborhood Council (VNNC), VNNC Outreach Committee on February 2, 2018 by vnncadmin. Quennpheena, State Senator Bob Hertzberg & VNNC Outreach Chair at the Woman's March. It was nice to see everyone at the march. Call to order & pledge of allegiance to the United States of America. Comments from the chair — Conversations, correspondence received.Introductions of first time attending stakeholders. Old Business:A. Update, Discussion and Possible Action. Anti-bullying awareness meeting. $1500.00 is already approved. B. Discussion and Possible action. Funding for local community family festival in Van Nuys. Sahag Yedalian (Field Deputy) of Council District 2. NTE $ 3100.00. D. Administrative item. Discussion in regards to the VNNC website. Committee will discuss to whom is responsible and able to post into the council’s website of outreach photos. This entry was posted in Van Nuys Neighborhood Council (VNNC), VNNC Outreach Committee on January 28, 2018 by vnncadmin. 12. Discussion and Possible Action-Backpacks and bookmarks for an upcoming event NTE$1000-Mr. Howard Benjamin. This entry was posted in VNNC Outreach Committee on October 9, 2017 by vnncadmin. This entry was posted in Van Nuys Neighborhood Council (VNNC), VNNC Outreach Committee on September 30, 2017 by vnncadmin.